Many homes with attics have a soffit, which is the exposed area that falls beneath the overhang of your home’s roof and its eaves. The reason so many homes with attics have soffits is because it aids in ventilation, cooling the space while also keeping it dry, preventing rot and mold from taking hold. 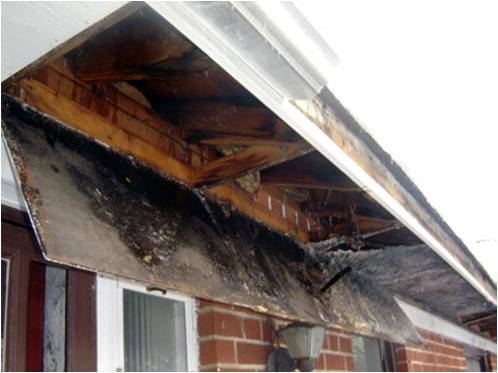 Needless to say, your home’s soffits are important to keep free from damage and in the best condition possible. Ignoring this piece of your home can lead to costly, and in some cases dangerous, problems. You can get a good idea of the shape of your soffit just by looking at it, but to really be sure that everything is in proper order you need to enlist the trained eyes of experienced experts. Soffits can come in a variety of materials, but one of the most effective and durable is vinyl because of its ability to withstand extreme temperatures while also being exposed to regular moisture. But even vinyl soffits need to be replaced. Or, in some cases, it needs to be installed altogether. Installing soffit is something that is best left to the experts, which is why Suffolk County Gutters specializes in soffit installation and installing soffit vents. Let us come check out your home today! We will give you a consult and make sure your home is protected year round, day in, day out.